An existing mural beneath the train overpass on the east side of Browne Street. The west side, currently blank, is one of the locations that will be painted. Spokane Arts, the nonprofit community arts organization, is looking for artists and artist teams to submit proposals for a series of new murals in downtown Spokane. 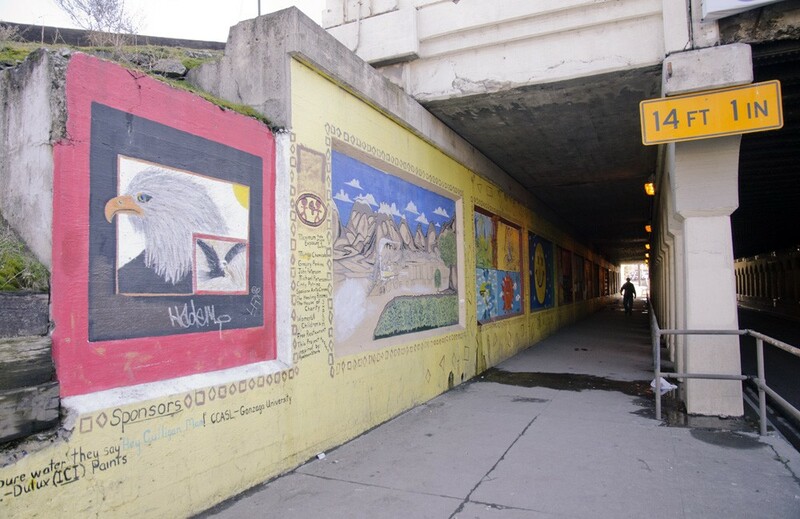 Painting of the murals is scheduled for this summer, from June to August, and the sites include the cement walls of railroad overpasses crossing Howard, Wall, Maple and Browne streets. Some of the overpasses will be painted on both sides, others only on one side, the request states. Artists are to be compensated for their work, ranging between $1,500-$1,750 depending on the mural location. Materials, equipment, site prep and other expenses are also being covered by Spokane Arts. The project is only open to local artists/teams, as its goal is to "provide the area’s visual artists with an opportunity to develop mural projects that will encourage progressive attitudes toward visual communication in public spaces, fostering a sense of ownership and community interactivity in the railroad underpasses." Details on the application requirements and submission process is can be found here. The deadline to apply is April 8. In addition, Spokane Arts is looking for qualified artists/teams for a larger, long-term art project to commemorate the Spokane Arena's 20th anniversary next year. The project, co-organized by the Spokane Public Facilities District (PFD) and Spokane Arts, is to commission a piece of artwork for the interior main entry of the arena. Plans are to reveal the piece, being budgeted for $45,000, at a special event in mid-September 2015. Specific proposals for the artwork aren't being requested at this time, but interested artists can apply to commission it here. The deadline to apply is July 17, 2014. A pre-proposal workshop for interested artists is planned for next Tuesday, March 18, at 1:30 pm at the arena's northeast entrance.